This building mostly dates from c.1400. It even retains its original windows. The chapel (on the north side) and the porch were added in the 15th century and the roof rebuilt in the 16th. 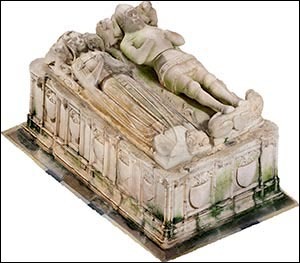 The chapel contains an alabaster tomb chest with effigies of Gronw Fychan and his wife Myfanwy. He was great uncle of Owain Tudor, grandfather of King Henry VII. Owain lived at Plas Penmynydd, near St Gredifael’s Church, and married Queen Catherine after the death of her husband, King Henry V. Their grandson, Henry Tudor, was born in Pembroke Castle and lived in exile in France before returning in 1485 to establish the Tudor dynasty. It’s thought that the alabaster tomb chest (pictured right by Gwynedd Archaeological Trust) was made in Derbyshire or Nottinghamshire. It depicts Gronw (who died in 1382) in armour and overcoat, his feet resting on a lion. Even his moustache is carved in detail, with the tips spreading out past the edge of his chain-mail head-dress. Myfanwy is carved with angels beside her wimple (cloth covering the top, back and sides of the head) and small dogs at the hem of her dress. She may have been the daughter of Iorwerth ap Ednyfed Gam of Pengwern, near Llangollen, and possibly the subject of a Victorian painting at the Institude building, Caernarfon. The chest was moved to the chancel of St Gredifael’s Church from Llanfaes monastery, where it had probably been damaged in the dissolution of monasteries (ordered by King Henry VIII, Henry Tudor’s son). The chest was relocated to the chapel at St Gredifael’s in the mid-19th century, after Queen Victoria gave the church a £50 donation. Rainwater leaking through a skylight caused some damage to the chest in the early 21st century. The roof was repaired but further funds are needed for full conservation of the memorial. Works to conserve the tombs and redevelop the church are being enabled by the Diocese of Bangor. In 2014, Gwynedd Archaeological Trust carried out a scanner survey of the chest, helped by a grant from Isle of Anglesey County Council. This revealed details on the tomb which had not been appreciated for centuries, such as carvings of Tudor roses and griffin faces. Also inside the church is a memorial to five local men killed in the First World War including Edward Williams, who lived in the Penmynydd almshouses (accommodation for poor people). You can read their details on our web page about Llanfairpwll war memorial, on which they are named. The church is closed to the public but open days are organised by the Friends of St Gredifael and Diocese of Bangor.